LUSH is a cosmetic company that boasts a variety of handmade cosmetic products that everyone can love. Whether it’s volumizing, moisturizing, curl-enhancing, or straightening, we women (and men) buy shampoos and conditioners that we hope will fit our needs. We go to the grocery store or hair salon and look for the magic words that will make our hair do exactly what we want, without any fuss or muss, so that we can go about our days with fresh and healthy hair. However, I recently picked up two different conditioner bottles from brands I frequently use and read the labels, only to discover that the ingredients were exactly the same. However, I wasn’t going to go without shampoo and conditioner, so I bought the cheaper one and used it for several months. That is, until I visited LUSH cosmetics with a family friend in San Francisco, where my life was changed forever. For those who haven’t heard of it, LUSH cosmetics is a company that boasts “fresh handmade cosmetics” that range from makeup, to makeup remover, to natural hair coloring bars, and finally to shampoo and conditioner. Now, while it does have a wide-range of products to choose from, what sets LUSH apart is clearly listed in the first line of their mission statement, which reads as follows “we believe…in making effective products from fresh organic fruit and vegetables, the finest essential oils and safe synthetics.” LUSH cosmetics makes all of their products from fresh, all-natural ingredients and mixes them to create a wide variety of products that can meet the needs of all types of hair, skin, and preferences so that their customers receive exactly what they desire. Not one to be so easily won over, despite the alluring display of all LUSH products, which are laid out to purposefully look like a farmer’s market bursting with color and fresh ingredients, I had to test it. I told one of the sales associates that I had curly, thick hair that I needed to keep relaxed and moisturized. Immediately, she brought over a bowl of fresh water and tried a few different shampoos and conditioners on my arm-hair so that I could feel the effects of each. Immediately, I was intrigued. Each product had its own distinct smell, and when I read the labels, each one had a different set of ingredients, their own unique names, and even an expiration date – just like fresh produce in the grocery store. Won over by the helpful staff and intrigued by the naturalness of the products, I picked Cynthia Sylvia Stout, a shampoo with beer in it to give shine and relax my hair, and Happy Happy Joy Joy, one of their most moisturizing shampoos. However, the sales girl also recommended their leave-in hair moisturizer and defining cream R&B, which would help control my sometimes frizzy hair. I hesitated, not sure I was ready to buy so many products from a brand that I had never tried before, and she immediately said she’d give me a sample to see if I liked it. I was amazed; it’s every shopper’s dream to have samples of products you’ve never tried before, and though that’s a distant thought in most salons, the young woman told me that LUSH cosmetics will always offer samples on their products so that their customers make the right choices for their hair. Happy as a clam, I made my purchases and could not wait to try them. Two months in, and I am completely won over. My hair is much softer, shinier, and my curls more relaxed; I would even go so far as to say my hair is much healthier since I started using LUSH cosmetics. But it’s not only the results that I love about LUSH; I also love what they stand for. Their whole mission, as a company, is to make quality, fresh, affordable products for all different types of needs, and that are cruelty-free by not using animal testing. Not only that, but LUSH also contributes to the community by donating and participating in local charities. This is what really sets LUSH apart from other cosmetic companies – they care about their customers, their products, and their community. 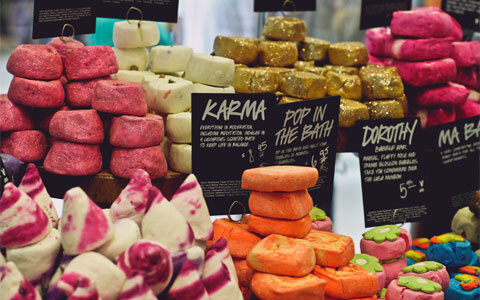 As a company, LUSH cosmetics has grown in popularity and demand, and it’s opening new stores throughout the U.S. As long as they continue to do what they do best, there’s no doubt in my mind that they will continue to grow and prosper. If you would like to know more about LUSH and/or would like to order products from LUSH, you can visit their website at www.lush.com to find the perfect handmade cosmetic for you.